So this is the story of what I believe to be a Celestron Super C8 from about 1983 that I bought from an amateur astronomer over in Arizona. 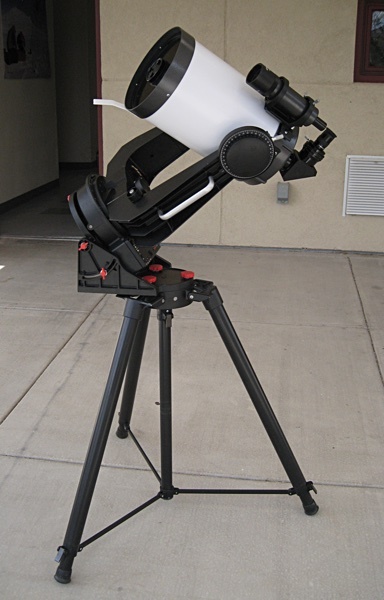 I was looking for a C8 to use with my Losmandy GM-8 mount, and the classified ad for this scope on the CloudyNights.com website showed it already outfitted for just such a life. The problem is that once you get into these Celestron telescopes you know that none of them of this era were sold as just an OTA (optical tube assembly). You know that they at least came mounted in some kind of fork mount that had some kind of motor drive, and that they were optionally mounted on a tripod of some kind. They were generally sold as complete sets. It can feel kinda sacrilegious to break up the set. At least that's what happened with my original C8 that had recently returned to me. But I didn't have any emotional attachment to this one. Right? The scope was in pretty good condition, except for one thing. This paint texture. I hate this wrinkled, elephant skin texture. I like elephants, though. I don't know why I don't like this stuff, but it really bugs the crap out of me. It does on anything I've ever seen it on. The tube just had a couple of small blemishes in the paint. Every blemish down to just pieces of dust show up on black painted things. There was also at least one speck of dust on the mirror. I had no choice but to tear it apart and repaint it, right? 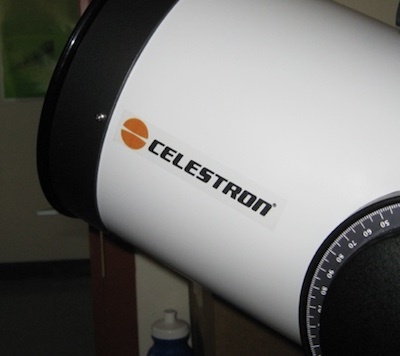 I think the original original Celestron telescopes were a white tube with black ends. At some point the 1960's they switched to a white tube with a sort of dark sky blue ends. Those were pretty. The late 1970's brought the classic greenish-tan and orange. Those can make your heart go pitty-pat if you are a true geek. In the 1980's they added an all black paint job. I didn't mind this telescope being all black, but for random reasons having nothing to do with the fork mount I wasn't supposed to buy for this tube I decided to make the telescope a white tube with black ends. 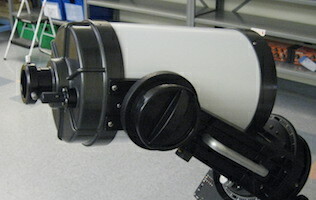 It's a fairly traditional scheme for telescopes. The tube responded fine to an assault of noxious Zip-Strip paint remover. Just a couple coats and it was ready to go. The mirror cell and the front ring, were an altogether different matter. "Different matter." Never mind. The front ring was not even interested in cooperating. It was at this point I decided to get serious. 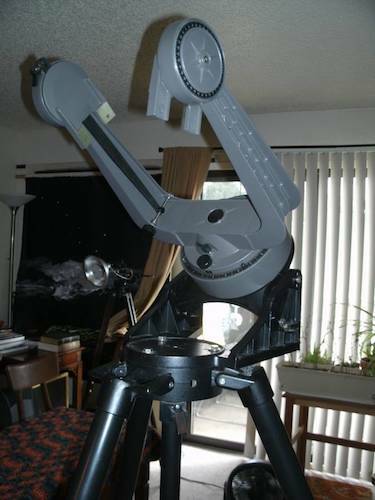 So while all of this was going on, in fact, the day after I arranged to buy this C8 and drive over to Arizona and pick it up (the next day is, technically, 'during'), the perfect set of forks for this telescope popped up on one of the classified ad sites. I thought this telescope was going to go on my GM-8?? 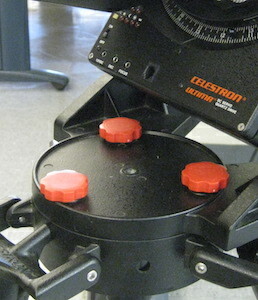 The mighty Celestron Ultima-PEC. 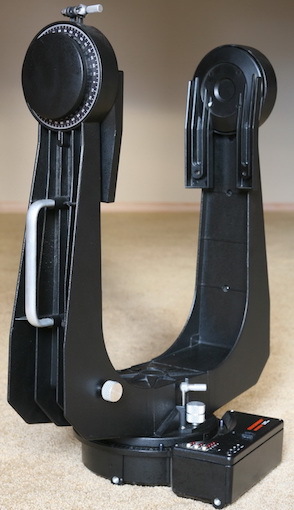 While it is stronger and more elegant than the older Celestron fork mounts this mount is really mostly air. The picture above is from the The Web. The one I picked up didn't survive fully assembled long enough for me to take a picture after I got it home. This isn't even a picture of the exact right mount, but close enough. The mount had been sitting a while. A long while. In a humid place. I didn't know northern New Mexico was that wet. Maybe it was kept in a greenhouse or something. Anyway, it was kinda gunked up. 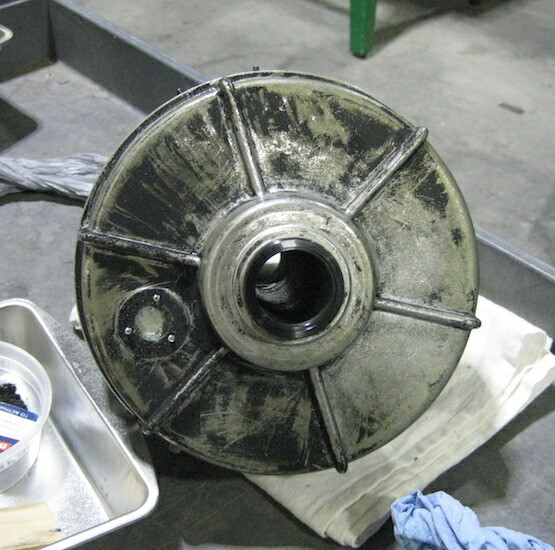 The grease was not very red anymore, and in some places it was getting hard. Not a good quality in grease. Other than switching to DC motors that didn't require high voltages (120/220VAC) and coming up with circuits to alter AC voltage frequencies these newer mounts used one motor, instead of two, and used the motor to drive a worm that meshed with a big worm gear. This made a big improvement to the tracking accuracy. It's pretty much the way all drives are nowadays. This mount -- electronics and motor -- runs on a 9V 'transistor' battery. Pretty amazing. You can also plug it into 12VDC. The built-in drive system was pretty complete for it's day. The "PEC" in Ultima-PEC refers to Periodic Error Correction. In a nutshell you let the mount drive for four minutes and it records how far off from pointing exactly at a star the errors are. Four minutes is how long it takes the worm to turn one revolution. Now that the mount has an idea of its internal idiosyncracies you can tell it to play the corrections back to compensate for them while it is tracking. 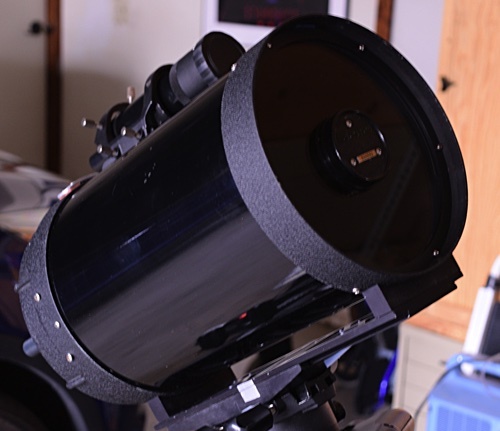 In addtion to the PEC stuff the system can drive a declination motor, command a motor connected to the focus knob of a telescope to turn, and also run the tracking motor at the four popular astronomy tracking rates: sidreal, lunar, solar and king. And all of that with a 9V battery for many hours. We've come a long way. It now takes a car battery. About a week after I had gotten two of the four parts together to use this telescope not in the way I had originally intended -- the scope and the forks -- and re-construnction on everything was well underway, I gave up resisting and started looking for a tripod and wedge (the part that tips the scope back so it will point at the celestial pole). About a week later up comes an advertisement on the Denver Craigslist. A Celestron HD tripod, a "standard" wedge, and another fork!? I didn't need the fork, but, OK, it was part of the deal. I took an overnight mini-vacation road trip to the town of Colorado Springs. Left on Friday and came back Saturday. The tripod was used, and old, but not abused. The wedge was kinda shiny, but the fork was weird in that it didn't look used at all. I don't think it ever even had a telescope mounted in it. It must have been from the 1980's. 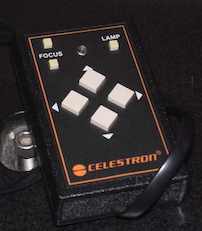 That's the only time Celestron made these. I suspect that the wedge was part of the original purchase and that was why it was so shiny. It hadn't been used, either. It gets a little more bizzare, but that's another story. These old C8's are pretty handy to use for things like educational outreach. I kinda decided that was what I was going to use this telescope for. They are quick and easy to setup and take down, there's not a lot of things to break, and there's not a lot of wires for people to get tangled up in. Since I can't leave well enough alone I decied to complicate the set up a bit and add some wires for people to trip over with encoders. 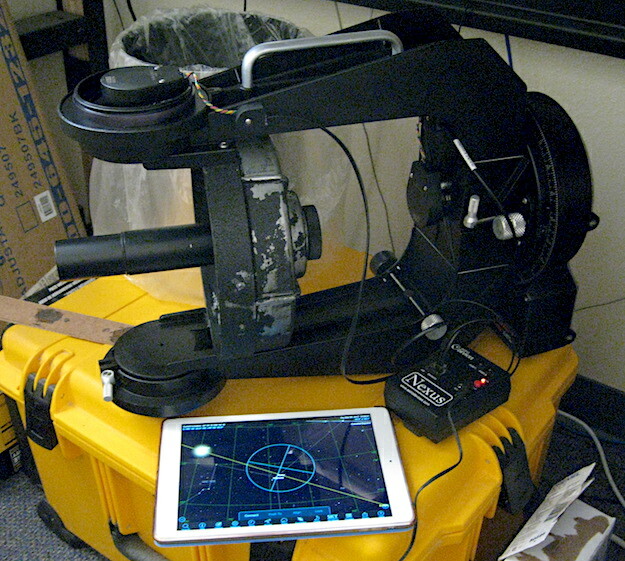 With my Losmandy mount, its encoders, an AstroDevices Nexus unit, an iPad and SkySafari software I can see on a star chart where the telescope is pointing. Why not this mount? 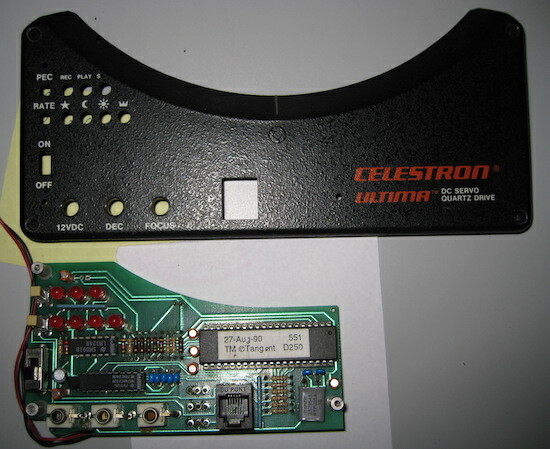 Back in the day Celestron made a kit with an azimuth/right ascension and elevation/declination set of encoders, mounting hardware, and a small control box that would tell you where the telescope was pointing, but with those kits not being made anymore I had to come up with a custom solution. Third party folks build kits that can be used, but what fun would that be? 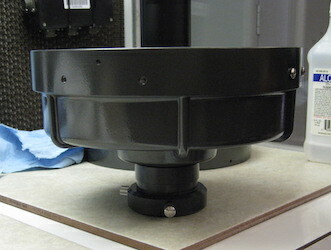 Step one was getting a place to attach the azimuth encoder. The azimuth bolt that keeps the forks attached to the base did not have a place to attach encoder parts to, so I bought a stainless steel bolt and had a 1/4" (plus a little) hole drilled into it, and replaced the original bolt. That's the new one above. 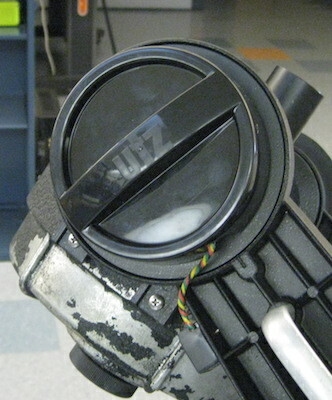 Normally the azimuth encoder (which becomes the right ascension encoder when the telescope is tilted back using the wedge) is attached to an approximately 1"x6" thin metal bracket that has a hole on one end for the shaft of the encoder to be bolted through, and a small hole on the other end for a screw to go through to attach the bracket to the fork. 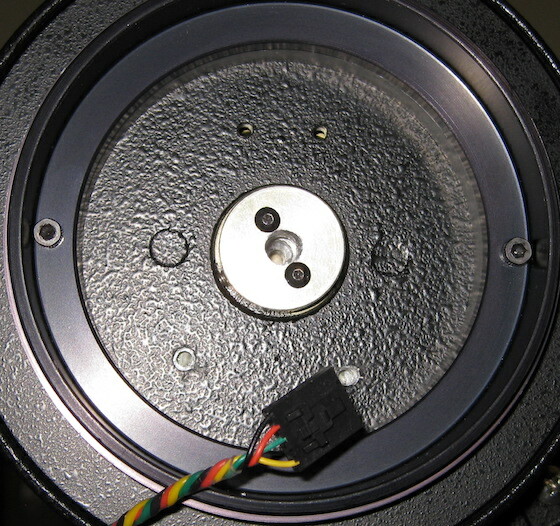 The shaft of the encoder goes into a sleeve similar to the hole in the bolt above. That's the smart way to do things. In the interest of taking the path of most resistance I didn't do things that way. I settled on using US Digital, 2,500 ticks per revolution encoders. I ordered them from AstroDevices in Australia. They were a fair bit larger than the encoders that the mount had been designed for. Encoders were just smaller back then...at least the ones you could afford. The 2,500 ticks electronically turn into 10,000 ticks per revolution when connected to the Nexus unit. Nice! I got the idea to make things "cooler" and attach the encoder right to the mount with some longer screws and some spacers. I won't bore you with the details or the pictures, but after drilling holes, having the #4-40 tap break off in one of the holes, and needing to turn a small hole into a strip mine-sized hole to get the broken tap out screwing directly into the mount was no longer an option. At least for one of the holes. I thought about it for a while and came up with using short standoffs to attach the encoder to. Brilliant! Screw up overcame. I was going to use the same longer screw and spacer idea with the elevation encoder, but changed to standoffs even before I started drilling holes. Furthermore, deciding to epoxy the standoffs into holes in the mount, instead of drilling precisely placed threaded holes, played right into my wheelhouse. I'm so good at drilling holes that sometimes I forget which end of the drill to hang on to. One down, one to go. This standoff idea worked well. Now, there's something not quite right about this mount. 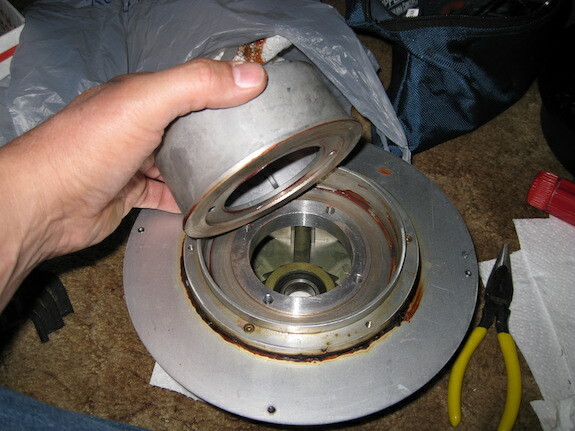 I know that the hole that was drilled in the azimuth bolt was right in the middle of the bolt, but when the mount was turned in azimuth the encoder would move ever so slightly back and forth, like the hole was not lined up with the axis of rotation. You couldn't detect the misalignment any other way. It was just 1000ths of an inch. 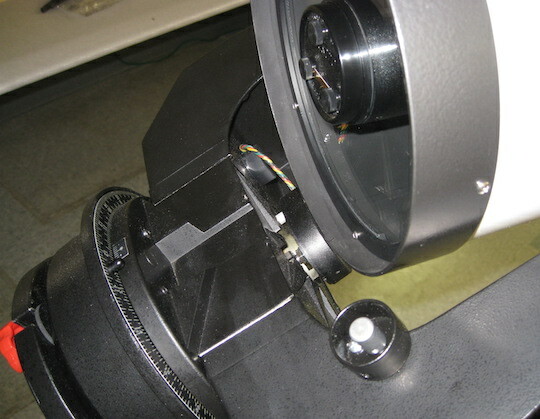 With the encoder attached firmly to the mount I didn't want this offset to push and pull the encoder shaft sideways and break something inside, so the shaft of the encoder was glued into the hole in the bolt with some Loctite Flexible Adhesive. It seems to work OK. The mount is happy. The encoder is happy. I'm happy. 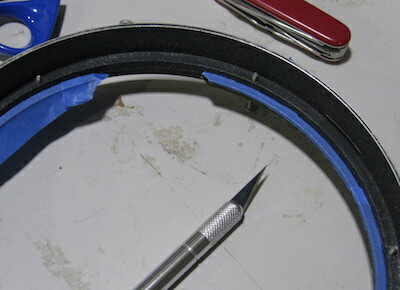 The adhesive being rubbery also makes it easy to remove the encoder next time I need to take the mount apart. 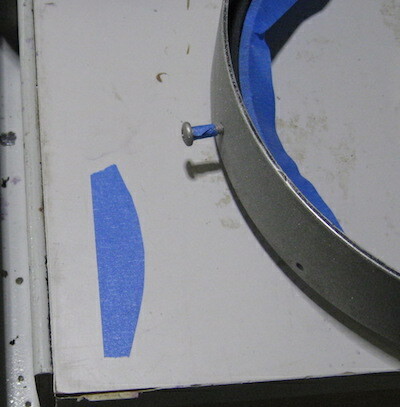 I drilled and tapped a hole in the arm and attached the encoder and RJ-12 socket pigtail to the mount. Ignore the extra hole in front of the RJ-12 socket. Getting the elevation encoder in was almost straightforward. 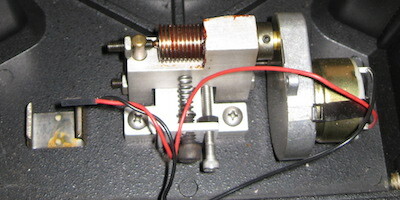 The elevation axis parts were made with adding an encoder in mind. 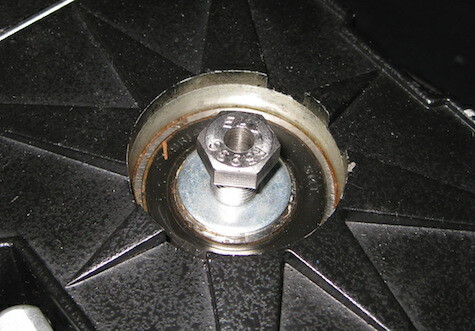 The hub of the axis had a doughnut washer that already had a 1/4" hole and a set screw that was used for grabbing on to the shaft of an encoder. Problem was that at some point in time someone enlarged the 1/4" hole with a small explosive. 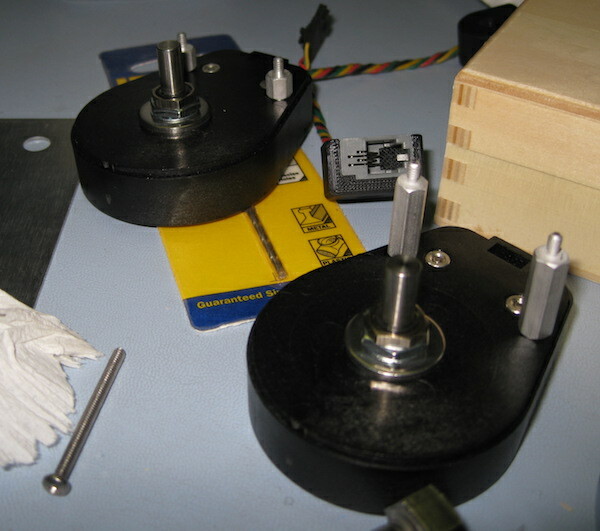 It was no longer round, so if I used the set screw the shaft of the encoder would have been way off from the center of the axis of rotation and it would have been the azimuth misalignment all over again. Flexible adhesive came to the rescue. 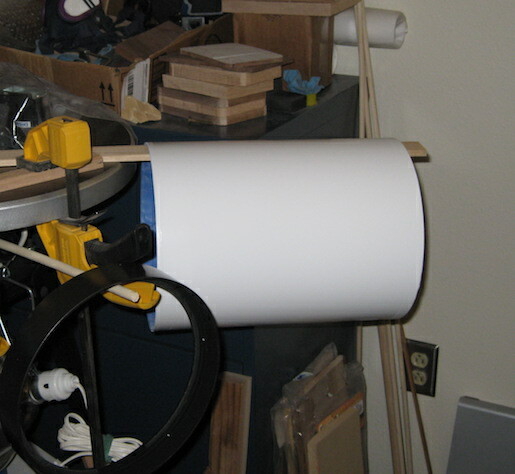 I just spun the part that attaches to the telescope around slowly while the adhesive set up. The encoder settled in the middle of the strip mine. 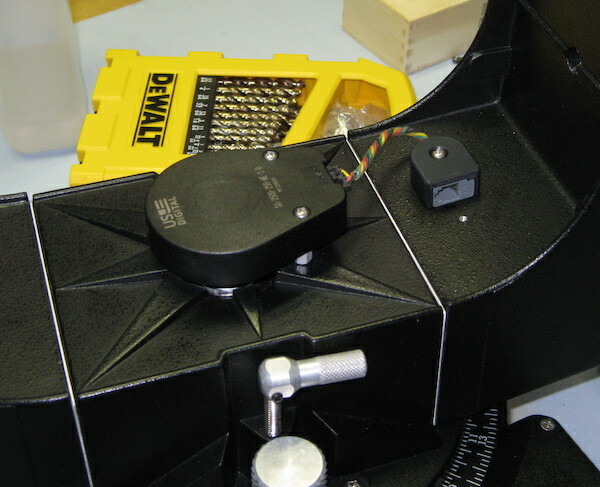 Then I tightened up the screws securing the encoder in place. 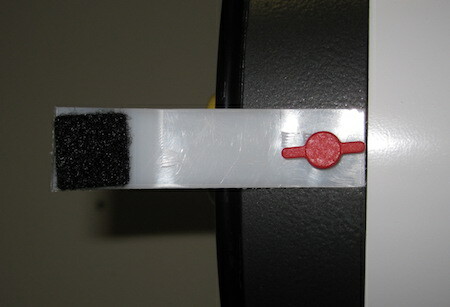 In this picture you can see the two silvery holes near the connector. Those are where the encoder standoffs attached. 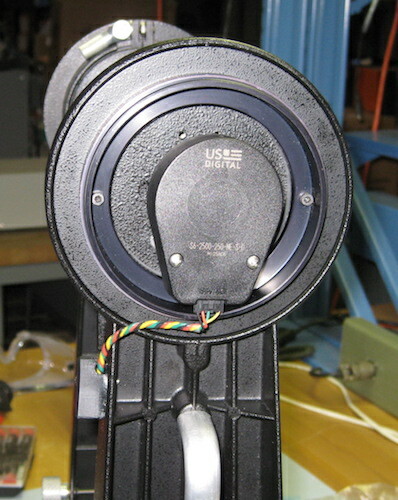 The two holes near the top were for the original mounting kit. These encoders were too big to use those. Two down, none to go. Smoke test. Worked just like planned. 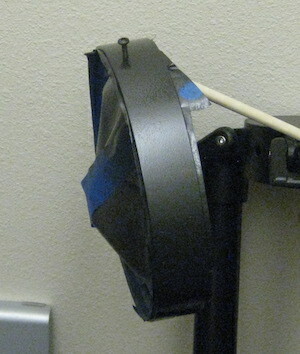 It is laying on its side because the flexible adhesive for the elevation shaft was not quite dry. Cursor movement in SkySafari was pretty smooth. I was afraid that the cursor would jump across the display like it was at the end of a Slinky being dragged across the carpet, because of the rubbery nature of the adhesive. 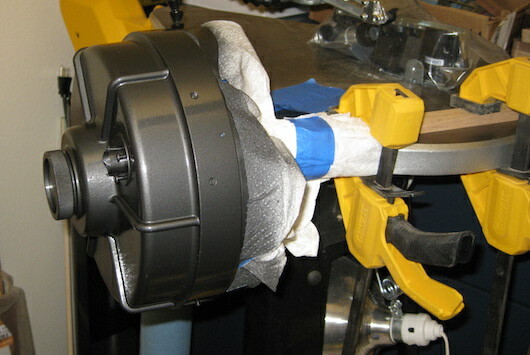 The adhesive may have trouble staying stuck to the sides of the hole in the azimuth bolt and the encoder shafts. They are all pretty smooth. I'll just have to keep an eye on it. I just used the partially stripped mirror cell to keep the elevation parts aligned correctly while I was installing the encoder. There's quite a bit of play in the movement of the elevation parts when the tube is not installed. Mount up. So with three of the parts ready to go I decided to get them all together while I stalled on getting the old paint removed from the scope. 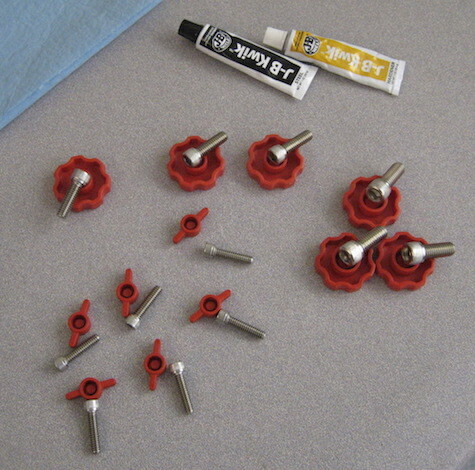 You can buy 'no tools' knob sets for putting everything together, but for about the same price you can build your own. Between the local Ace Hardware store, and our local lumber yard I was able to come up with enough stainless steel cap head bolts and plastic press-on knobs. I used a little J-B Weld to help keep things together. Used a vice to press them together. Went with red just for fun. VERY nice! Much better than bare bolts. A lot better than black knobs. See the red knob at the top of the circle in the last picture? 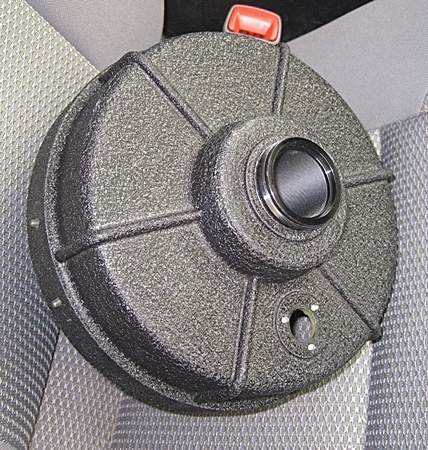 See the gusset (triangle) connecting the side of the wedge to the bottom of the wedge behind that knob? See the gusset to the right of that one partially obscured by the base of the fork? 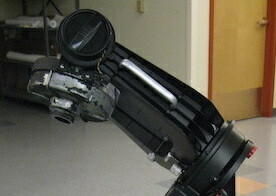 Guess how far that gusset, and the one on the other side, allowed the telescope to tilt? Two degrees less than I needed. If I lived in Colorado I'd have been fine, but New Mexico? Nope. I took the wedge to a machinist and told him 'off with their heads'. Now it will tilt so far that I can move to somewhere in Old Mexico. Ahhh. Time to relax with a little snack and a scotch? No! 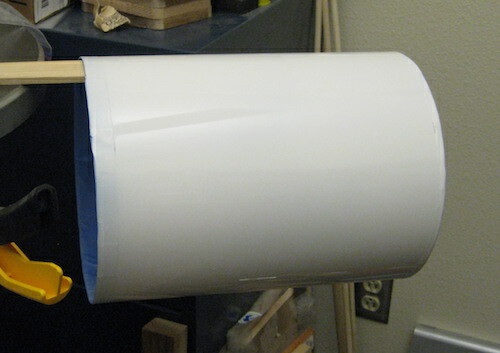 Super gluing a little foam to the inside of the lid from one of these Utz Pub Mix tubes and cutting an opening made a perfect cover for the elevation encoder. Mount's done. So where's the newly painted telescope to go with it?? 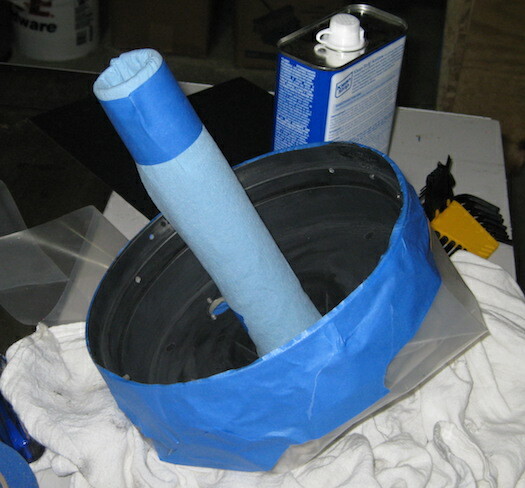 Since the tube was the easiest to wrap up in plastic and blue masking tape I tried out the paint of choice for the inside of the telescope before I did battle with the rest of the parts. It seemed to do a good job. What do you do when life gives you hard to remove paint? You beat the crap out of it with high pressure air and sand. 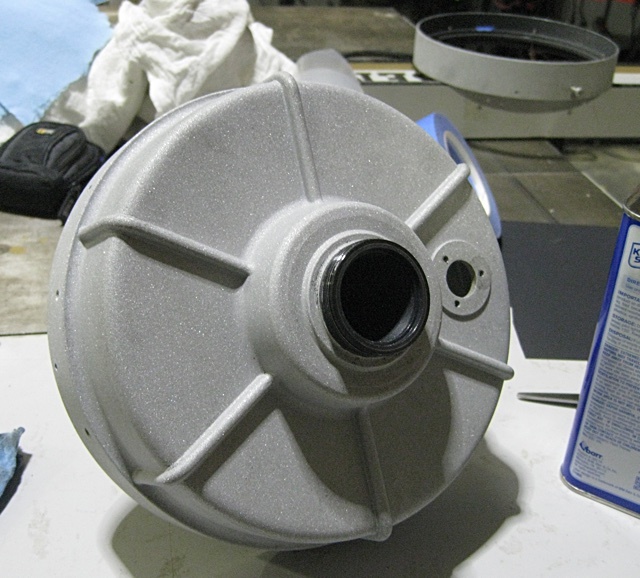 Thanks to lovely and delightful relatives just up the Rio Grande I was able to do some sandblasting and get rid of the remaining paint on the mirror cell/back of the telescope, and the front ring. I should have done this to start with. First thing you need is sand. Check. Got a ton -- as in 2000 pounds -- of it for free from the local perlite mine. That should be enough. 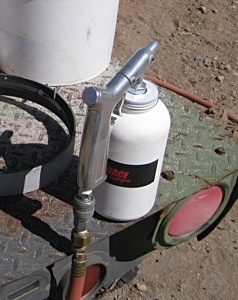 Next thing you need is a sand sprayer, compressor, and some high pressure air hose. Check check check. The fine folks up the river had that stuff too. 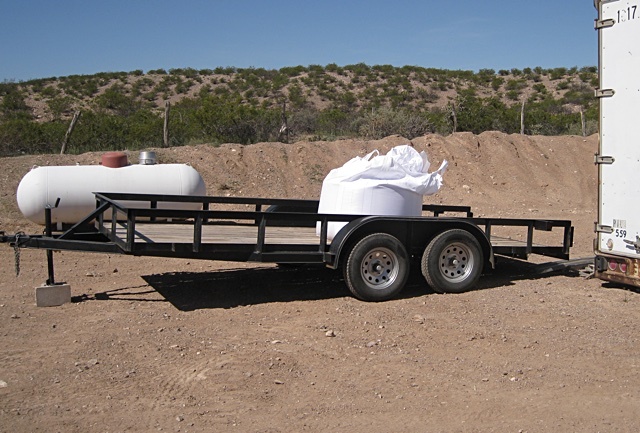 I'd always thought sandblasting was a big deal, but that's really all you need if you have a place out in the country and the whole state of New Mexico is sand. About 15 minutes and about 1/2 bucket of sand later (Got Sand?) the old paint was no longer a problem. 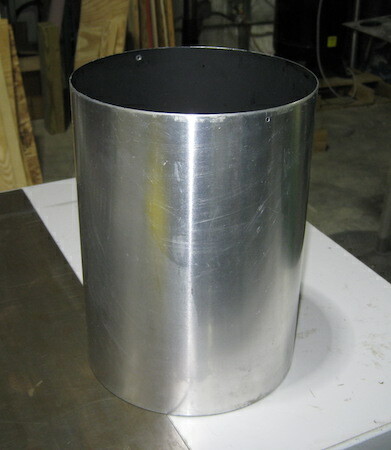 Bare aluminum. The sand I used may have been a bit overly aggressive for use on aluminum, but I was careful and it all worked out. It left a nice surface. I didn't get every molecule of old paint off, because I was being careful not to sit in one place too long, otherwise I think I would have just left the two pieces bare and put a clear coat on them. I liked the look. Sandblasting in the morning. Painting in the afternoon. I didn't remove any of the inside black paint from the pieces, since there wasn't really anything wrong with it, instead I just scuffed it up a bit with some 600 grit sandpaper and left it as a primer. I had run screws from the inside of this piece to the outside for the sandblasting phase to keep the threads of the holes from getting damaged. I reversed them all for this round of painting. All wrapped up and ready to go. It didn't really matter if a little of this paint got on the outside of the piece, since it was going to be black too, but I sealed it all up anyway. 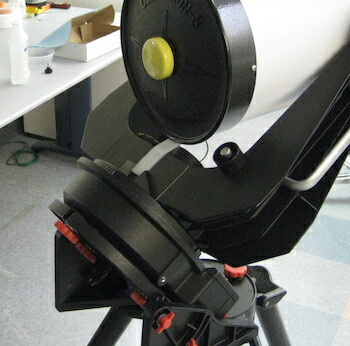 The insides of a telescope need to be flat and black. Over the 20-some years the inside of this one had become kinda shiny and slightly gray. I used what I could get in town and that was chalkboard black paint. It came out OK, and was quite a bit blacker that the paint that was in there. It didn't end up shiny like it looks the picture. 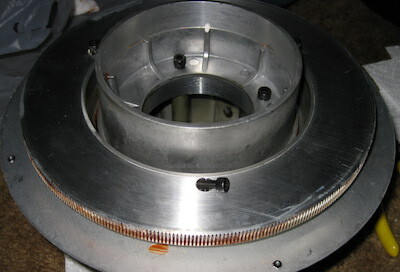 The front ring had a paper gasket that the corrector plate sat on. Getting it off would have destroyed it, and I didn't know where to get a replacement. I thought sure it would disappear at some point during the cleaning, the sandblasting, washing, and painting, but through all of the steps it hung in there. 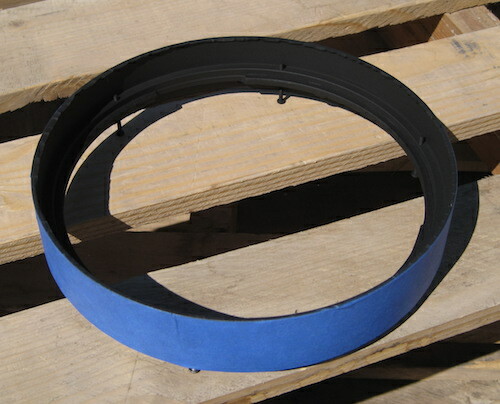 I cut pieces of the blue tape to the rough shape of the ring so they would be easier to put in place on the gasket to keep it from getting painted. Some long screws were placed in the holes for the corrector plate retaining ring screws to keep the threads clean. With the insides sprayed it was time to do nothing, but watch paint dry for a couple days. For the outside I decided to try and use the paint above. I didn't want just black, smooth and glossy. The cap on this can looked about right. A bit of arts and crafts and presto! Not terrible. It wasn't as dark as the can lid implied it would be, but...that was OK. It's gonna look great, I kept saying. Two down, one to go... A little more creative taping and done. I used a Krylon semi-gloss white for the tube. 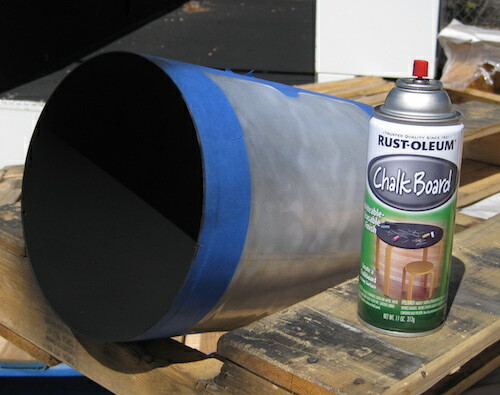 That stuff just shot right out of the can compared to the Rust-Oleum. More waiting. I guess this is what I get for trying to do a good job. On the last few swipes of a second coat of white a little line developed. I poked at it and it kinda grew. I have zero ideas about how this happened, but at some point something got on the first layer of white paint on the tube and whacked the second layer. It survived sanding and an isopropyl alcohol rub down. It must have been paint remover, but I've got no clue on how it got there. This spider web developed in about 15-20 seconds. It was depressingly cool. Oh well. Back to square two. Re-stripped the whole thing. I decided to change the paint on the outside. That Krylon paint was OK, but now I didn't trust it. 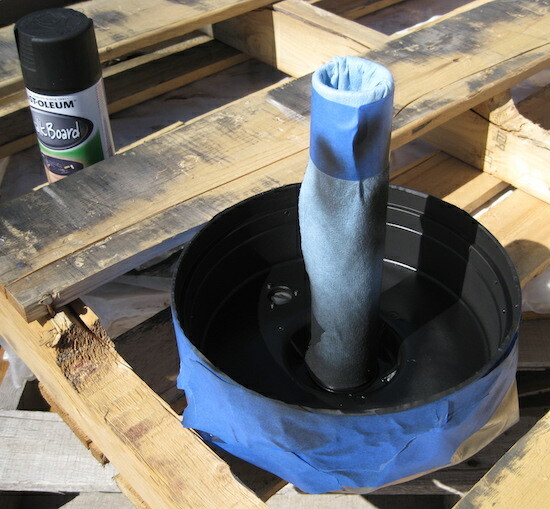 There was a white Rust-Oleum one that was the same as the black paint for the ends. Hmmmm. In spite of the tube set back I did manage to get one part of this project finished. 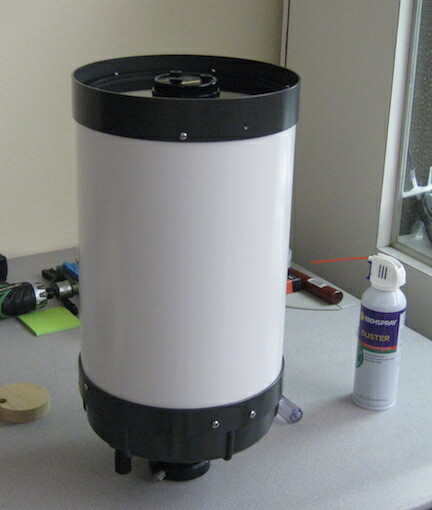 I was going to paint the 9x50mm finder scope tube white to match the telescope, but when I stripped the black paint off of it I found it was a machined and anodized black tube of aluminum. White probably wasn't the best choice. 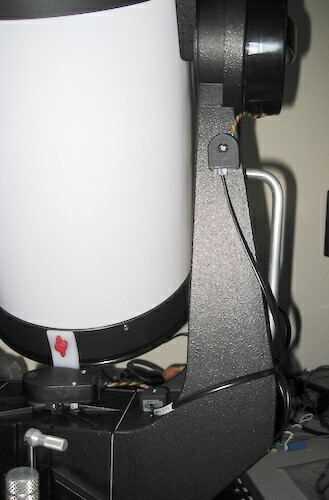 So I painted it the same dark grey (or light black) color as the ends of the telescope. It came out looking OK. 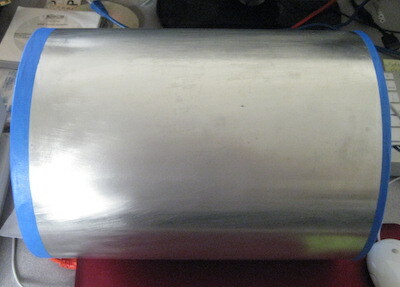 The tube of the same finder that came with my new C8 EdgeHD was just rolled aluminum sheet. That one I could have painted white. You know how the knobs on a high end stereo feel silky smooth and a little hard to turn making you think it's worth much more than you paid? That special effect is done with grease. 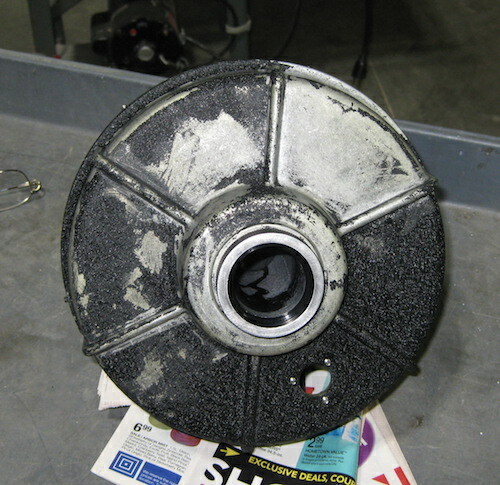 Damping grease. I got a small tube of it. 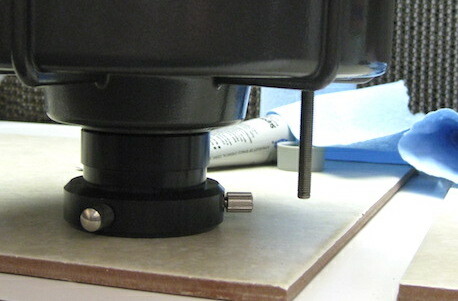 I put a little on the threads of the front objective ring of the finder and its locking ring. It made this finder feel at least $10 more expensive. 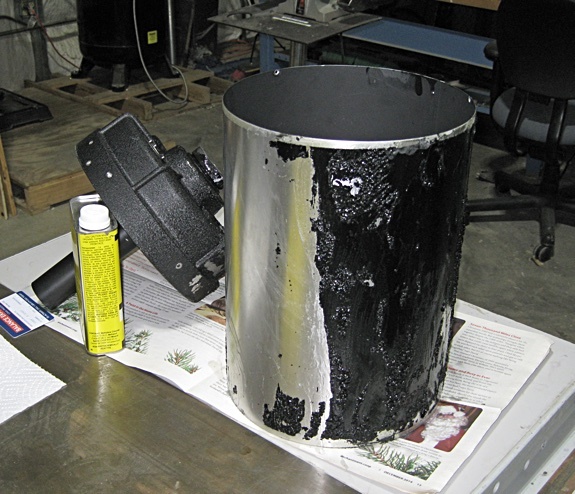 I'll use some on the focuser for the telescope if I ever finish playing around with the paint and get to put it all back together. 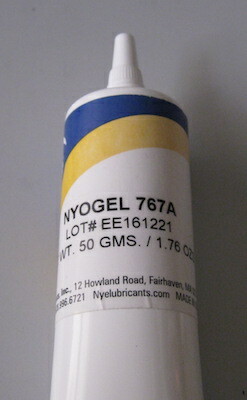 LATER: The Nyogel 767A isn't any good below freezing. A simple nut and bolt in the kitchen refrigerator test showed that. It is stiff, but after a little working it starts to act like its's not even there until it warms back up again. Then it's fine. I'll keep looking. BACK TO WORK!! After waiting (and waiting and waiting) for the black paint on the inside to dry I finally got to re-mask off everything and paint the outside. After a day it was pretty dry, so I peeled off all of the masking tape and plastic and set it aside like a good boy to let it dry a couple more days. I could have sanded it a bit -- there was a little bit of grit, probably from the air -- and done a second coat, but this project is already further over-budget than the F-35 fighter jet. Plus I didn't want any repeats of what happened last time I tried a second coat. It'll look great, I've kept saying. I switched to the same kind of paint as the end pieces. It did a pretty good job. I tried spraying as much as I could to see if I could get the paint to run, but couldn't do it, which is surprising. Usually I get all kinds of runs and drips in the paint when I'm not even trying. I just kept going round and round and ended up with pretty good coverage. It's got just the right amount of shiny, too. 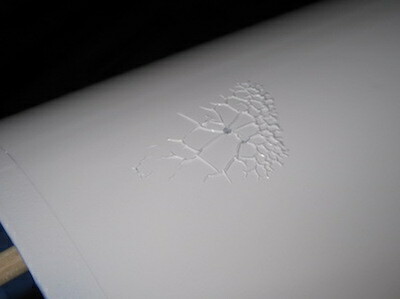 The main problem with this paint is that it leaks all over the place. It happened with the black can too. 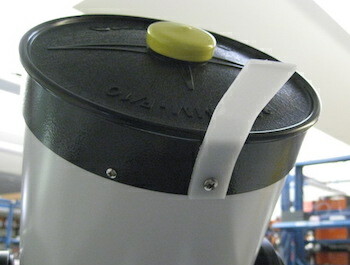 It collects inside the over-designed cap/trigger and dribbles all over. Then it flies all over when you periodically shake the can. Make sure whatever you are painting is not below the can. If paint would have managed to drip onto the tube you would have heard me scream. When I bought the Ultima set of forks I saw that spiders had built homes in the four large mounting holes in the sides of the base. 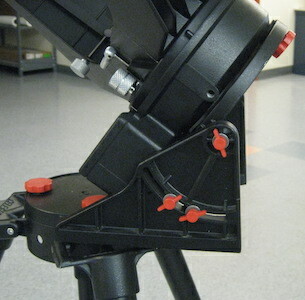 I wasn't going to be using those holes with the standard Celestron wedge, so I plugged them up with set screws. I'm sure the spiders will find someplace else to live. While I was working on this telescope I bought a little Celestron C5 Plus and it came with a Celestron visual back thread to 2" hole adapter. It was a little big for the C5, but it worked perfectly for attaching to the back of this C8 just for the purpose of getting a bit of extra height above the table. 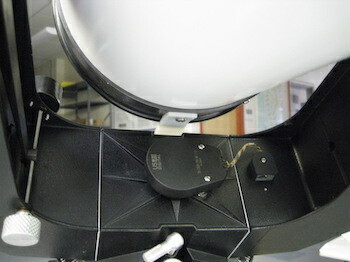 That, in turn, made it really easy to get the mirror assembly into the back section of the scope. 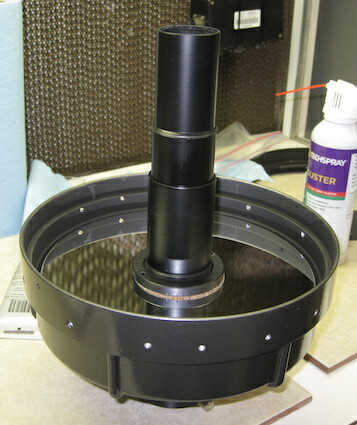 The extra height allowed the threaded shaft that is attached to the back of the mirror assembly, and is used for focusing the scope, to stick out the bottom without hitting anything. Reassembly was pretty straightforward. Get the mirror in. 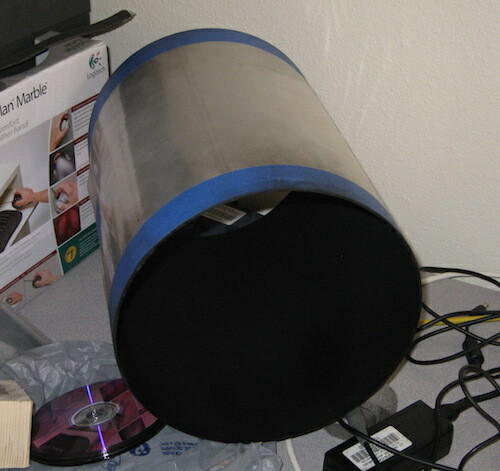 Connect the tube to the bottom/back of the telescope. Connect up the focusing mechanism and get it working. Attach the front ring. 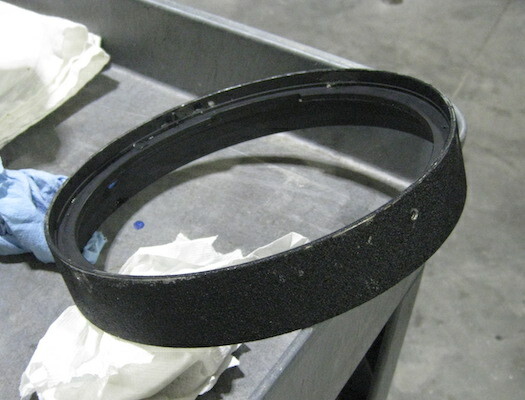 Drop in the corrector plate and seal it all up. I didn't remove the secondary mirror from the corrector for this cleaning. I did install a set of Bob's Knobs for the secondary. Once the tube is finished wrassle the whole thing into the waiting arms of the fork. So I knew this was going to be a problem from the beginning. I don't think these fork mounts were really made for encoders. At least not ones physically as large as the ones I had. 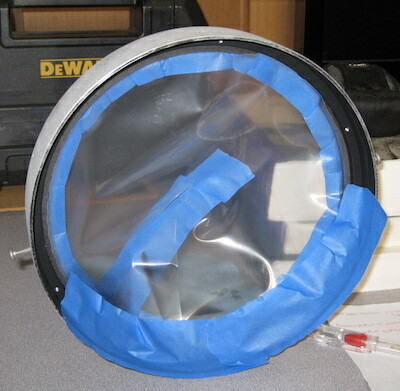 The front end of the telescope, and especially when the dust cover is on, comes pretty close to the center of the mount when the tube is pointed down in the stowed position. There isn't much room for anything like an encoder. My initial idea a couple weeks back was to cut away part of the front ring so it would be possible to still rotate the tube all of the way vertical. 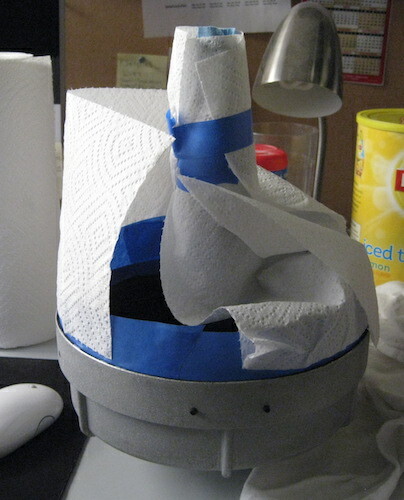 I'd just use a shower cap for a dust cover. However, now that everything was together, it was clear that the secondary wasn't going to clear and was going to be the next thing to run into the encoder. Cutting away part of the secondary would probably ruin the view of everything the scope was pointed toward. I needed a Plan B. On the plus side not having to worry about the clearance between the top of the encoder and the tube was going to make finding a cover for the encoder easier. It could be as tall as necessary. Plan B. 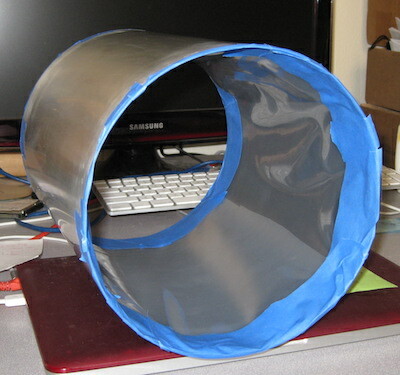 To prevent the tube from crashing into the encoder I rummaged around my office a bit, came up with a piece of low density polyethylene and made The Tongue. 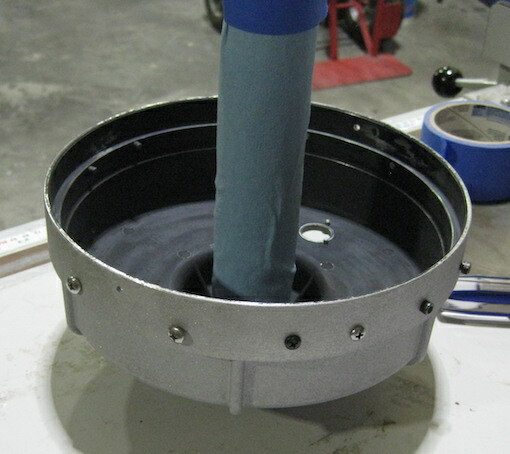 It attaches to the tube using one of the counterweight screw holes in the ring. I adjusted the shape a little with a heat gun. Made the width the same as a depression in the fork base that just happened to be in exactly the right spot. At some point I will drill and tap a hole so the other end can be attached to the base of the forks which will keep the scope locked in the stowed position when it is being transported. I'll make fancy red knob thumbscrews so it can be removed. It doesn't need to stay attached when the scope is in use. That problem ended up easier to solve than I thought it would. Finished product. It looks pretty good from a distance. I still have a couple odds and ends to do, and I'm sure there will be a bunch more once I start using it, but for now it's operational. Comet 41P/Tuttle will be its first target. Forgot to put my sticker on there before the glamor shot. I need to work on the character spacing a little more. One odd or end done. I added a little square of the fuzzy half of some Velcro to the tongue just to give a little cushion when the scope is stowed, and made the fancy knob. I'm going to hold off on drilling the extra hole for the tongue. The elevation lock will be fine for keeping the telesope stowed for now. That the square of Velcro not being square with the plastic is going to drive me nuts, but I'm going to leave it just to be mean. Added a couple of pieces of Velcro to the fork arm for mounting my Nexus unit. 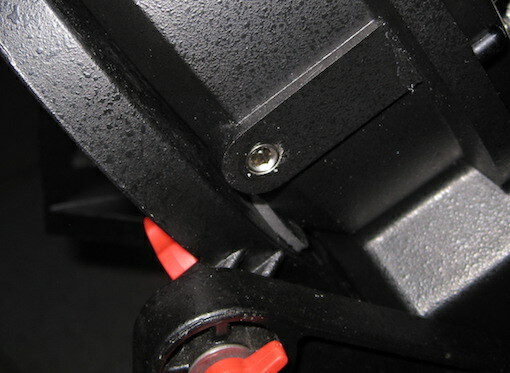 I use Velcro on my GM-8 mount, so the box already had Velcro on the back. The extra wire running from the encoders is coiled up and attached to the fork handle. I'll eventually make a shorter set of cables that are just the right lengths. I put the box on the 'front' side of the forks, because it has a slowly blinking red light above the red button. 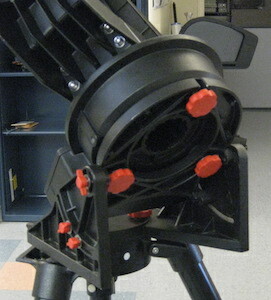 That way it will be facing away from the back of the telescope. If I weren't such a Scrooge I'd buy a new Nexus II box that has an internal battery, then I wouldn't have to worry about running a power cord. That would be slick. 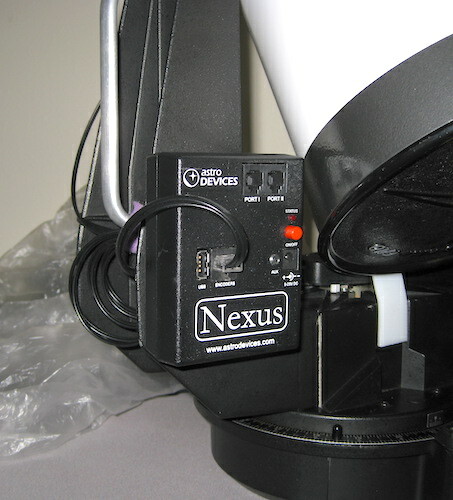 At the very least I will probably alter the Ultima mount and add a 12VDC outlet so I can run a short cord from the control panel to this Nexus unit. That's the way it is set up on my Losmandy mount. Well that's not good. This picture doesn't show it, but all of the white paint under the orange ball in the sticker is stuck to the sticker and not to the tube! I went to remove the sticker and put a better looking one on and the paint peeled off. 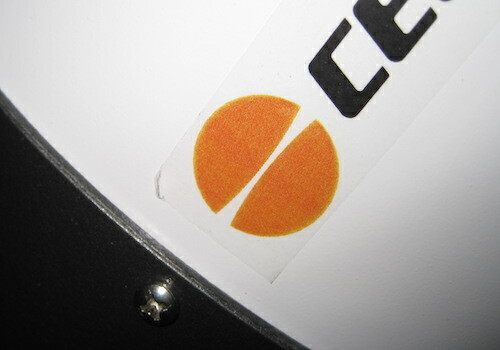 I'll just scotch tape the sticker back down for now and think about repainting the tube...third time's the charm. 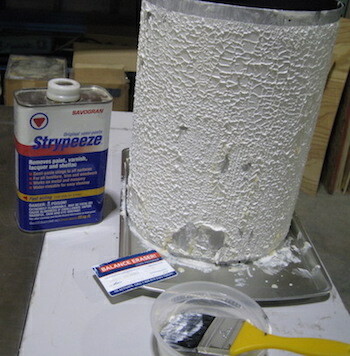 I don't think I will ever be using Rust-Oleum "Universal" paints again. - A little more grinding of the gussets on the inside of the wedge. We got them out of the way, but I'd like to just take them all of the way out. Done. Had a machinist remove them completely. Done. Changed to a Baader DOVE-B finder bracket, so now I can use any of my finders. - The tripod could use new rubber feet. They are kinda hard to find. - Cover for the azimuth encoder. 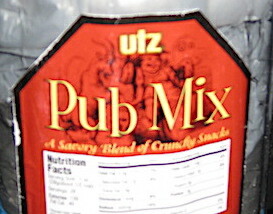 I guess I'll have to buy some more Pub Mix. Not done. Can't find the right size/shape item. Still looking. - Power cord(s) for connecting the mount to my regular battery box. Add a 12V power outlet to the mount for the Nexus. Done. Made the Power Box to mount cord, but did not alter the mount to put in a 12V outlet. Will just use the Nexus II that has its own internal battery, instead of butchering the mount.